Merlin is my Umbrella Cockatoo. He is special because no matter how I feel on any given day he can and will always make me laugh with some goofy antic he does. Merlin is sure to tell everyone he sees that he is a "Good Boy" and greets them with a friendly "Hello!" 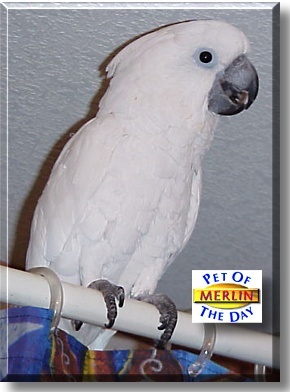 Merlin loves to go for rides in the car to the bank, video store and to the hardware store. Merlin also goes to work with me. I work with foster kids and they are always happy to see him. Merlin also loves all the attention he gets from the kids. He soaks it up like a sponge.